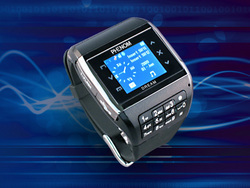 In conjunction to the holiday season, Phenom Communications has launched its unlocked watch phone which named as Dream. The watch phone has been designed to support two SIM cards that enable two phone numbers in one watch phone. The watch phone is featured with super advanced quad band technology which aimed to be used in almost all around the world. Dual active standby SIM card slots. 1.3-inch TFT LCD with 260k pixels. Supports languages in English, Espanol, Italiano, Portuguese, Arabic and French. Supports formats including mp3, mp4, midi and wav. Available in night black, the watch phone is now available for the promo price of $395.